Hilti's SF 6H-A22 ATC Cordless Hammer Drill/Driver is the essential item for Tradesmen who require performance, safety and durability. This tool is the perfect kit because it has the power to tackle tough applications and provide the user with improved safety thanks to the Active Torque Control feature that helps protect the user during difficult drilling applications with no affect on performance. This Industrial class tool kit comes with 2 batteries, a DC charger and a small tool bag to give you exactly what you need to be successful on the job. 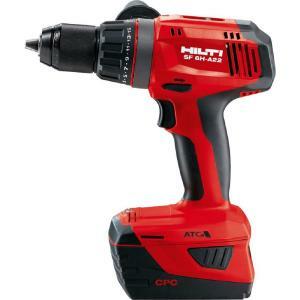 Tbook.com crawls the web to find the best prices and availability on Hammer Drills and related Tools and Hardware products like Hilti 22-Volt Lithium-Ion 1/2 inch Cordless Hammer Drill Driver SF 6H with DC Car Charger. For this page, related items include products we find that match the following keywords: "Hammer Drill" at our vendor partner Home Depot. Hilti 22-Volt Lithium-Ion 1/2 inch Cordless Hammer Drill Driver SF 6H with DC Car Charger is one of 148 Hammer Drills and related products listed in the Tools and Hardware section of Tbook.com If you have any questions on this product, please give us a call at 734-971-1210 during the hours of 9am - 5pm EST for assistance. Thank you for shopping at Tbook.com, the Internet Department Store!